Please call any of our sales professionals for additional client references or a current resume’ of our projects. Thanks for your interest and patience. Fortune 500 Boardroom with full premium Bose audio and video integration. Rear LCD projection with mirror mounting system. Auditorium audio and video. Multiple A/V and projection equipped training rooms. AMX Control systems in main areas. Compete Audio Video presentation systems for 3 rooms including LCD projection, sound systems and system control. ESG Custom system control, LCD projection, VGA scaling and switching capability. State of the art Training Rooms with SmartBoard podium technology, Dual rear screen LCD projection, VGA over CAT5, Premium audio reproduction. 130’ Custom Truss Structure, Whole Facility Audio and Video Distribution System with SoundTube speakers, Eiki LCD Projectors, TOA Mixer Amps and LG Plasma Monitors. Interfaces, Sanyo LCD Projectors, and TOA Mixer Amplifiers. Strand CD Series Dimmer with Control Console and Custom Distribution Cabling. Work performed in a secure lockdown environment. Control, Kramer Scaler Switcher, Custom Table Inputs. Custom Bose PA System designed for high intelligibility and weather resistance. Minimal impact to surrounding community while providing high volume in stadium. Special Event Production, Custom Podiums. Over 50 Technology/Smart classrooms with full video, audio and Smartboard capability. Custom Podiums and Extron control systems. Multiroom multizone DSP controlled gym with SoundTube high intelligibility audio system powered by QSC amplifiers. DSP system control. Included integration of key existing audio components. Community R Series Weatherproof Speakers, QSC Amplification, Rane DSP. camera and monitoring systems, noise masking. speaker systems. HD Plasma and LCD Monitors. Indoor and outdoor audio and video distribution. Sports bar and pub environments. Multiple TV systems. Modulated video distribution. Background music and DirecTV equipment. Addition of LED Theatrical Lighting, Martin MX-4,s and new dedicated control system. Dimming, Martin LightJockey touch screen controller, SLS Ribbon Line Array main speakers with EAW Subwoofers. Eiki 5000 lumen LCD Projector with 15’ diagonal screen. for use in extreme heat and cold year around. all new Lightronics Dimmers and Control, Multipar Stage Lighting Fixtures. Full Lightronics Dimming System with Wall Station and fader board control. House lighting, stage light and emergency lighting integration. addition of a choir monitor rear wall projection with a custom long throw lens system. Complete custom stage and architectural lighting system. Lightronics wall pack dimmers, ETC Source 4 PAR-EA lighting fixtures, IR remote control of scene selection. Just updated house chandeliers and wiring for all house lighting. 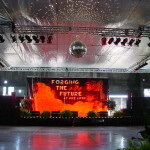 Multiple Large Screen LCD Projection, Theatrical Lighting, Ongoing rental support. Projection system with video head end, projection screen, control system. 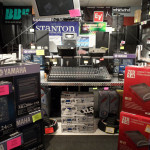 Peavey Sanctuary Series Speakers, TOA Mixer Amplifiers, Shure MX and SLX Microphones.